Strength you can trust. Easy to use. Quicker cooking time. Seals in all the juices. Skin turns golden brown. No washing up! Suitable for ovens and microwaves. Use me to create great tasting roasts... without the fuss! How to use me, it's as easy as 1.2.3... In Conventional Ovens: 1. Pre-heat oven to required temperature. 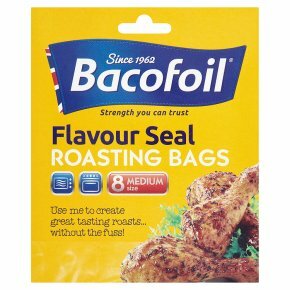 Season food and place in Bacofoil Flavour Seal Roasting Bag. Allow sufficient air inside the bag to assist the meat to brown and tie bag loosely with nylon tie. 2. Lie the bag flat in a deep roasting tin. Pierce 15 fine holes in the top of the bag to allow steam to escape. Make sure the bag does not touch the oven walls, racks or heating element. 3. Cook for the required length of time. Carefully remove from the oven and leave to stand for 5 minutes before opening. Caution, the steam will be very hot. Cut the bag open, remove the contents and serve! In Microwave Oven - Note: Cooking whole poultry and large joints is best advised in a conventional oven. 1. Use in the same way as in a conventional oven and place in a microwave-safe dish and cook at the appropriate power level for the required time. 2. Prior to cooking, pierce 15 fine holes in the top of the bag to allow steam to escape. Make sure the bag does not touch the microwave walls, racks or heating element. 3. Carefully remove from the microwave and leave to stand for 5 minutes before opening. Caution, the steam will be very hot. Cut the bag open, remove the contents and serve! Cooking Guide: Beef: Temp: 200°C 400°F Gas Mark 6, Time: 25 mins per 500g plus 25 mins extra Lamb: Temp: 190°C 375°F Gas Mark 5, Time: 25 mins per 500g plus 25 mins extra Pork: Temp: 190°C 375°F Gas Mark 5, Time: 30 mins per 500g plus 25 mins extra Veal: Temp: 200°C 400°F Gas Mark 6, Time: 25 mins per 500g plus 25 mins extra Poultry: Temp: 190°C 375°F Gas Mark 5, Time: 20 mins per 500g plus 25 mins extra Cooking times can be varied according to individual preferences and differences between appliances. Bacofoil Kitchen Tips A tip from our cooks in the kitchen... Place fresh lemon zest, juice, garlic, olive oil & herbs in your roasting bag to create a zingy flavour. WARNINGS:<br>Do not let Roasting Bags touch any part of a conventional oven or combination microwave. Make sure the temperature of the oven does not exceed 200°C/400°F/Gas Mark 6. Not suitable for use in the oven or microwave when the combined grill is on.<br>Caution: Hot steam. To avoid danger of suffocation, please keep this product away from babies and small children.